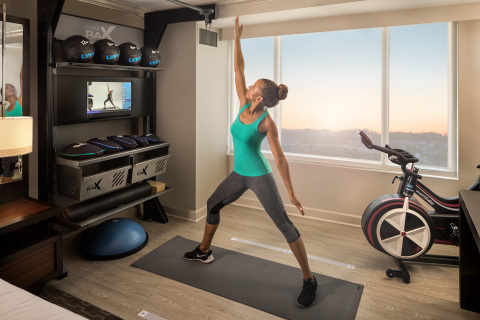 MCLEAN, Va.--(BUSINESS WIRE)--Hilton (NYSE: HLT) has unveiled Five Feet to Fitness™, an in-room wellness concept that brings over eleven different fitness equipment and accessory options into the hotel room. 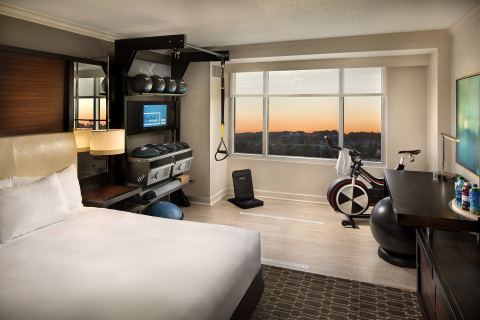 The new room category makes it more convenient than ever for road warriors, exercise enthusiasts, and those who prefer to workout in private to maintain their routines while staying with Hilton. 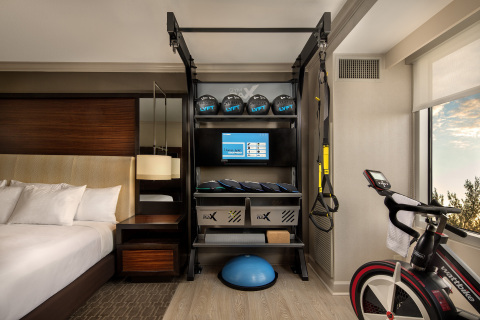 The rooms are part of Hilton’s innovation efforts to modernize the hospitality fitness experience and make it more inclusive for all by redeveloping fitness centers and offering fresh fitness concepts tailored to the hotel’s location and regular guests. “The variety of activity the room enables is motivating. One morning a guest can decide to roll out of bed for quick guided stretch and yoga poses. Then later that evening, he or she may return from a stressful day and take a brisk bike ride while catching up on a favorite show or the day’s business news. The room is made to suit the varied and evolving wellness habits of our guests,” said Mr. Crabbe. Hilton (NYSE: HLT) is a leading global hospitality company, with a portfolio of 14 world-class brands comprising nearly 5,000 properties with more than 812,000 rooms in 103 countries and territories. Hilton is dedicated to fulfilling its mission to be the world’s most hospitable company by delivering exceptional experiences – every hotel, every guest, every time. The company's portfolio includes Hilton Hotels & Resorts, Waldorf Astoria Hotels & Resorts, Conrad Hotels & Resorts, Canopy by Hilton, Curio Collection by Hilton™, DoubleTree by Hilton, Tapestry Collection by Hilton™, Embassy Suites by Hilton, Hilton Garden Inn, Hampton by Hilton, Tru by Hilton, Homewood Suites by Hilton, Home2 Suites by Hilton and Hilton Grand Vacations. The company also manages an award-winning customer loyalty program, Hilton Honors. Hilton Honors members who book directly through preferred Hilton channels have access to instant benefits, including a flexible payment slider that allows members to choose exactly how many Points to combine with money, an exclusive member discount that can’t be found anywhere else and free standard Wi-Fi. Visit newsroom.hilton.com for more information and connect with Hilton on Facebook, Twitter, LinkedIn, Instagram, and YouTube.